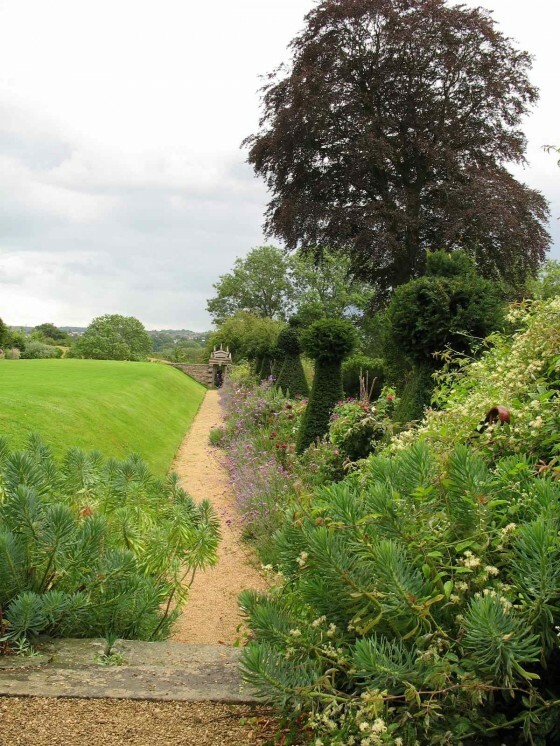 This August I visited a beautiful garden on the edge of Bristol. I could urge you to see it, but unfortunately it is being sold. So here are some pictures to commemorate this lovely place; let’s hope the new owners are also keen gardeners and will open it again. You will see umbrellas in these photos; they were taken when it was pouring with rain. 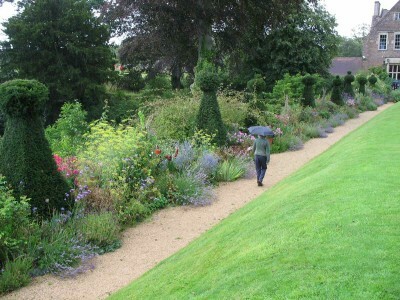 This shows that a great garden still looks good in bad weather! The house dates from the Tudors onwards, with a Norman barn. 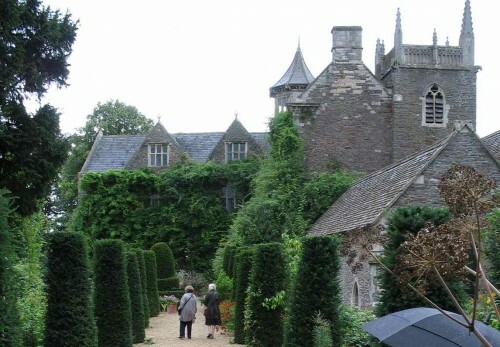 Through an old arch stretches a long lawn lined with flowerbeds and topiary. 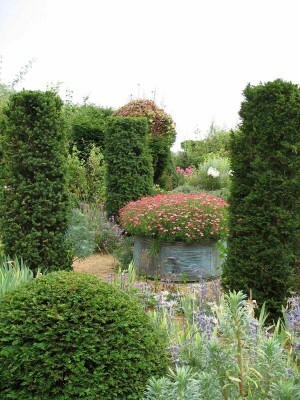 To the left of this are more topiary shapes, with some lovely large containers of flowers. 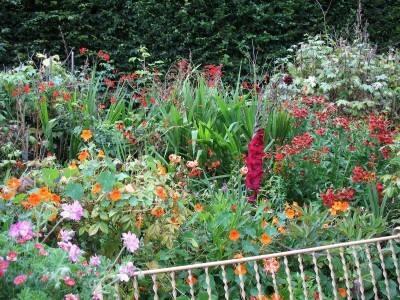 The beds are slightly blowsy now – August 8th was the last day of visiting – but full of colour. – a lovely place to celebrate weddings I imagine; there was a marquee next to it. 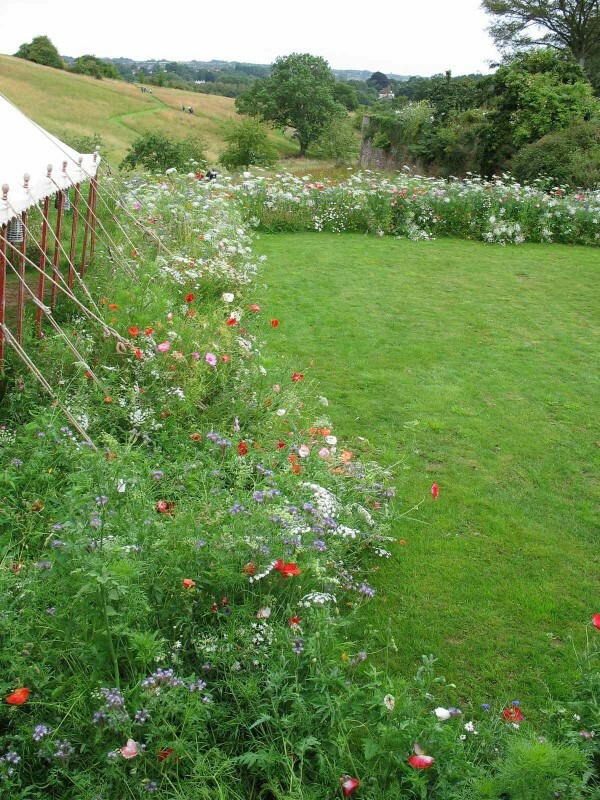 I imagine brides waltzing on the lawn serenaded by music in the marquee – very romantic! 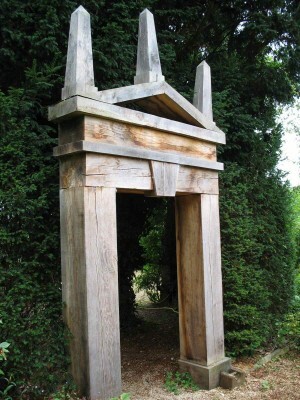 Leading through the garden are carved wooden arches – a modern interpretation of Classicism. 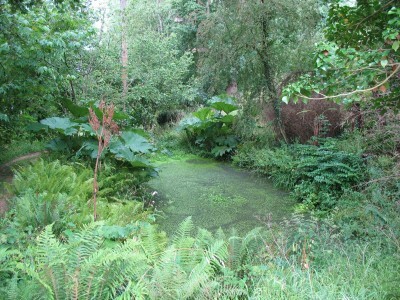 There is a wild patch of woodland below the lawn garden, with some ponds and gunnera. Also not pictured – a vegetable garden, a waterfall and a ‘stumpery’ full of tree trunks and ferns. 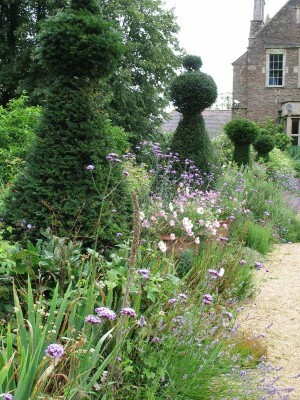 This is a dreamy romantic garden well thought out by the owners. 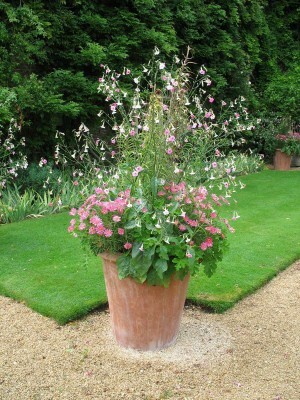 It doesn’t surprise me they are garden designers! 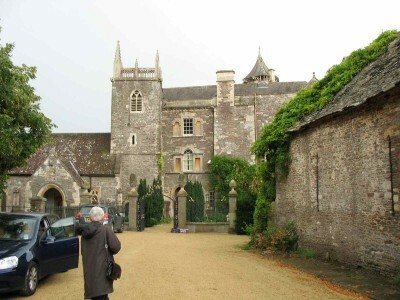 This is the Hanham Court website. It also doesn’t surprise me that the designers have worked in Highgrove which has a similar blend of romance and formality. 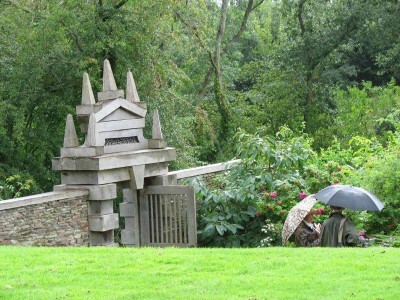 Great photos Jane – you did justice to it despite the rain! Thanks for taking me there. It’s strange you can’t see how wet it is! Thank you the photos are lovely. We are pleased to announce that the Gardens will be open Thursdays and Fridays, May 3rd to August 31st 2012 under new ownership. Thanks for letting me know – I’ll let my Bristol friends know too. I’m pleased you are still opening this beautiful garden to the public! Jane well done! We will make the effort to go and support them this year! Please note our new website is..
and we are on twitter at..